David Hardman is a PhD student with the V-SENSE project, in the School of Computer Science and Statistics, at Trinity College Dublin. 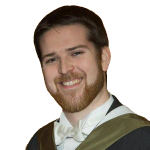 His previous academic experience includes gaining an MSc in High Performance Computing with the Edinburgh Parallel Computing Centre (EPCC), University of Edinburgh. Following this he undertook a position with the EPCC as an Applications Developer, during the start-up phase of ARCHER, the latest hardware incarnation for the UK National Supercomputer Service. In 2014 David moved to Dublin and started a new role with Intel Ireland as an Infrastructure Engineer for the Manufacturing IT department, a great opportunity to broaden his technical skill set. Outside of his regular working duties he took part in internal innovation events and formed a small innovation team submitting several patents for company review. Keen to devote more of his time to research and innovation, with a desire to involve high performance computing, David returned to academia in 2017 taking up a PhD position. His current research area focuses on light field technology, specifically the real-time rendering of synthetic views within a light field. My research area is in light field rendering.